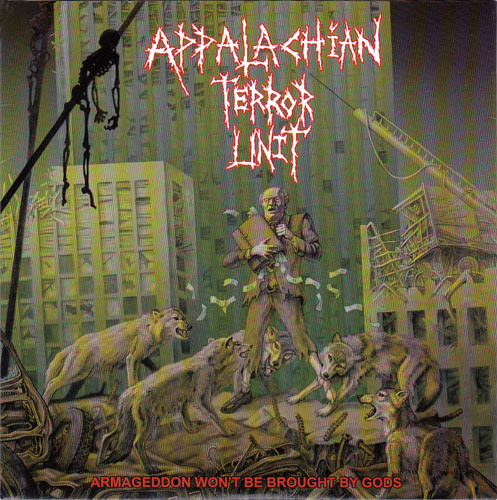 APPALACHIAN TERROR UNIT have announced re-release of their “Armageddon Won’t Be Brought By Gods, But By Men Who Think They Are…” 7″. Every once in a great while, a new band comes along with such intense fury that they captivate all who hear and see them. Anarcho-crust eco-warrior collective APPALACHIAN TERROR UNIT is that band, and ‘Armageddon Won’t Be Brought By Gods, But By Men Who Think They Are…’ is their seminal release, a 7″ slab of raw power and vitriol that will be resurrected from its long out-of-print status by venerable punk provocateurs Profane Existence on April 3, 2012. Hailing from the mountains of West Virginia, ATU belt out a thunderous chorus of eco-awareness and chastisement for mankind’s destructive ways (or at least those who are in control). 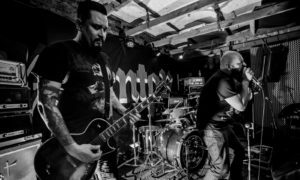 Musically they combine classic punk, crust, and a hint of metal into a sound that’s likened to latter day NAUSEA, totally reinforced by the strong female vocals throughout. Adding to the over-all amazing quality of this EP are additional touches of brilliance, like the brutally powerful recording by Jay (Antischism, Damad) at The Jam Room in South Carolina and incendiary cover / poster art by Marald. Normally this sort of praise for a job well done is reserved for bands who have been around the block once or twice — not for the debut EP from a band barely formed a year before recording, but ATU are far from “normal.” They are more a force of nature than a punk rock band. This is the band’s first 7” release, which originally came out in 2007 and has been out of print ever since, claiming its place as one of the most sought-after records in Profane Existence history! Keep an eye out for tourdates.